I can’t stay without baking for too long. As the days are getting hotter, I thought to myself, less baking so that the kitchen does not get too hot but unfortunately it is difficult to stay away from the oven. 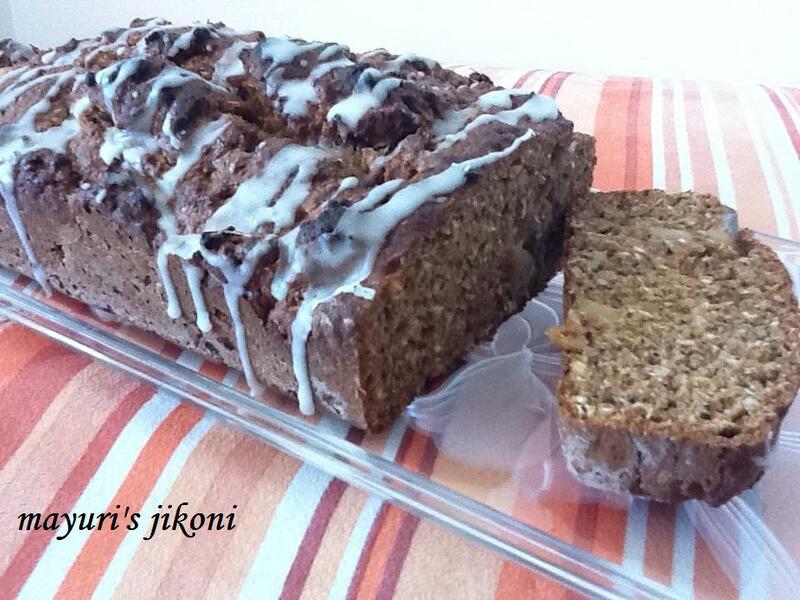 A few pineapple chunks were sitting in the fridge and I opted to try out an eggless pineapple tea bread. A bread without yeast, looking very much like a cake. I couldn’t find any pineapple extract or flavouring in the supermarket here but must get some during one of my foreign trips. I used tinned pineapples and the juice but still my husband thought that it lacked the pineapple taste. Bananas tend to overpower the other flavours. However, till I come across another good recipe, this is a good tea bread to have on its own or with butter, jam or honey. Grease a loaf tin with butter. Dust it with flour. Preheat the oven at 180°C. Sift the flours, salt, spices and soda bicarbonate together. Mix in the dessicated coconut. In another bowl whisk mashed bananas, sugar, oil and juice together. Add the flour to the whisked mixture and mix till the flour just gets wet. Gently mix in the pineapple. Do not over mix. Pour the mixture into the prepared loaf tin. Bake for 45 to 50 minutes till the top is golden brown. Insert a toothpick or skewer into the middle of the bread. If it comes out clean the bread is done. Remove the bread from the oven. Leave it in the pan for 5 minutes. Remove from the pan and cool it on a wire rack. Sieve the icing sugar. Add water and mix it well. Drizzle the glace icing over the bread. Serve. Can used crushed pineapple if you like. Omit the dessicated coconut and instead add that much flour. Add chopped nuts of your choice. Vary the amount of spice according to your taste.